If Elon Musk has a “bucket list,” it probably includes getting to Mars and eliminating our dependency on fossil fuels. Truth be told, there are more than a few skeptical of his achieving either one. What about kicking the fossil-fuel habit? Getting off fossil fuel is another matter. Roughly a third of fossil fuel is used in transportation — which Musk’s Tesla Motors is addressing with electric cars. But a third of fossil fuel in the US goes into the electric grid (and this would increase if transport shifted to electric vehicles. Tesla is now attacking this too, with plans to get people off the grid — or at least to use it more intelligently. Currently, it is prohibitively expensive to get off the grid. However, companies are getting close: building hybrid systems using one or more of the following power sources: solar, wind, fuel cells, or battery power with grid power as a backup. Since Musk and Tesla employees know about batteries, that is where they focused their effort. Powerwall assemblies can be ganged together providing up to 90 kWh total for the 10 kWh Powerwall and 63 kWh total for the 7 kWh Powerwall. 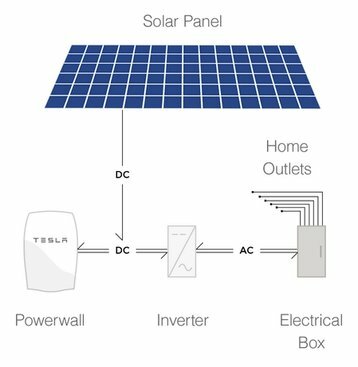 So with enough Powerwalls and a solar array of sufficient capacity, it is possible to relegate the grid to backup status. 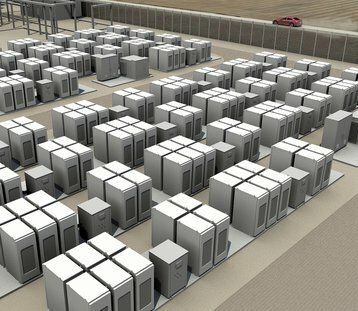 Larger organizations such as data centers will be more interested in the larger-capacity Tesla Powerpack, a 100 kWh battery storage system, which according to Musk is infinitely scalable. One way to think about the Powerpack is that each of the Powerpack racks in the illustration below is the equivalent of 10 Powerwalls. If the ROI is there, this should interest companies owning power-gluttonous data-centers. Cole also mentions that, Li-ion batteries can produce a runaway chain reaction that leads to an explosion as shown in this University College London video. These incidents are extremely rare, but Cole urges caution as there is little available data on Li-ion batteries storage systems of this magnitude. Another voiced concern has to do with Musk’s mention that solar arrays could fit on the roofs of larger buildings. That is true, but in most cases the ideal location for a data center is not the best spot for renewable-power production. Living in Minnesota, I can attest to that. My solar array is much less efficient than one of the same capacity in Florida. Several well-known enterprise-size businesses are taking part in pilot programs with Tesla. Amazon Web Services (AWS) has a test program based on a 4.8 MWh Tesla energy storage system in AWS’s US West (Northern California) Region data center.